An article at Cyberpresse.ca which happens to be in French has some interesting information regarding the the vintage jerseys the Montreal Canadiens are rumored to be wearing this season to celebrate their centennial. I used Google to translate it to English. In addition, the Canadian will take advantage of the centennial celebrations for dusting four of his old sweaters. This season, the Montreal players will don jerseys retro twice, once on November 15 against the Philadelphia Flyers and a second time on 1 February against the Boston Bruins. In the first case, it is the jersey of the 1915-16 season to be worn by the Canadian players. The second time, Montrealers will skate wearing the jersey of the 1912-13 season. Apart from the terrible grammar of the translator, there's some interesting stuff here. While it appears to suggest the Habs will wear four "old sweaters," it suggests only two dates when they will be worn. Unless the Canadiens are planning on a wardrobe change for each of those games, I think we might need some clarification. But it sounds like they're at least wearing the 1915-16 sweaters against the Flyers on November 15 and the 1912-13 sweaters against the Bruins on February 1. If someone would like to track down pictures of those jerseys, I'd be happy to post them. A quick Google search turned up nothing useful for me. 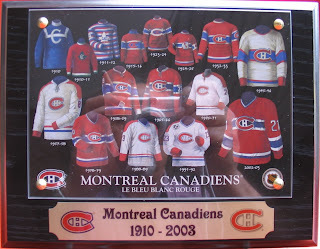 UPDATE (3:04 PM): Thanks to Alan for finding an image showing the Montreal Canadiens' uniform history. In the upper left corner are the jerseys we might be seeing on the ice this season. The 1915-16 sweater is clearly labeled but we have to assume the sweater labeled 1911-12 is what they mean by 1912-13 in the article. Both very interesting jerseys.